Apollo 11 present an oversized lunar photo to the Neil Armstrong Middle School Iconic golor glossy 10.75 x 13.75 photo of Aldrin standing on the lunar surface, with photographer Neil Armstrong visible in Aldrin¹s visor, signed and inscribed in black felt tip ³To the students and faculty of the Neil Armstrong Middle School with sincere appreciation and best wishes from Apollo 11,² and signed in the lower border in black felt tip, ³Neil Armstrong,² and ³Buzz Aldrin.² Michael Collins(in drk black) has added his more recent signature below the original period signature which was beleiveied to be a secraterial signature of Collins done by Buzz at the time of presentation. Inscription and all three period signatures fairly light, but still legible, with Armstrong¹s being the lightest of the three,Collins recent signature dark and bold, uniform moderate crazing to image, vertical crease touching beginning of the Collin¹s signature, small bumps to all four corners of mount, as well as some scattered creases to mount, otherwise very good condition. Throughout the US, there are over a dozen schools named in honor of Armstrong. 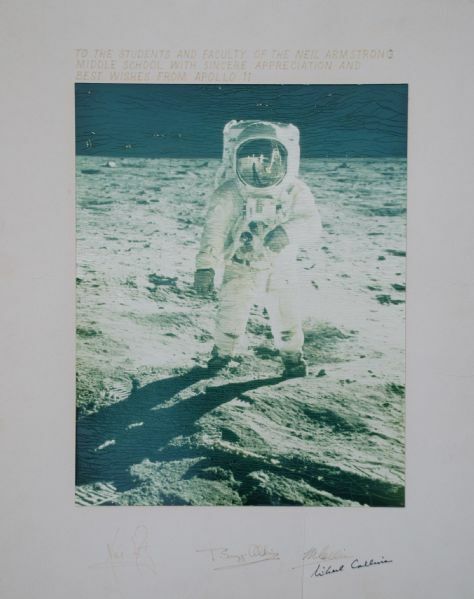 Oversized portraits signed by Apollo 11 crew members are highly sought after by collectors.